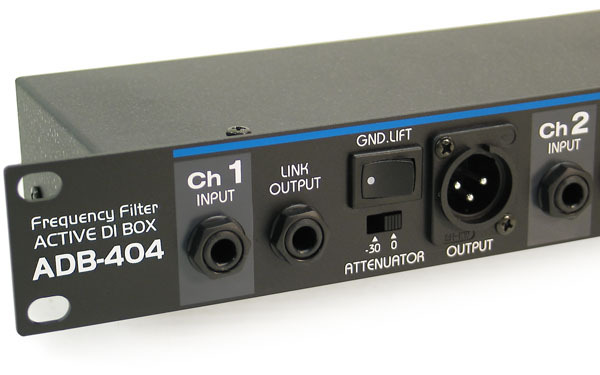 This is the EWI ADB-404 Rack-Mountable Four Channel Active Direct Box. This is ideal for the keyboard player or any other musician (or A.V. company) that needs four D.I.’s in one spot. This is an ACTIVE D.I., so you will see little if any degradation of the signal put-through. Also, this unit will need to be powered by a 48volt phantom power feed from the board or with an outboard 9V power supply (included). This is a profession grade active D.I., suitable for studio use, or touring. The transformers used (which are the key to a nice, fat, clean D.I. signal) are very high quality and specifically made for widely varying dynamic musical program. The transformers are specifically manufactured for EWI to ensure high reliability and performance that is acceptable to all but the most discerning users. The EWI ADB-404 is loaded with features: There are parallel balanced 600 ohm XLR outputs, one on the front, and one on the back for each channel. The 50Kohm ¼” inputs and outputs are high quality all metal panel jacks which will hold up to years of plugging and unplugging. Each channel is equipped with a 0, -30dB switchable pad. Also each channel is equipped with a heavy-duty rocker style ground switch properly labeled “GND” or “Lift”. The chassis is heavy gauge steel and the front mounting plate is 0.075” extruded aluminum (no plastic here). As well as being durable, the all-metal construction further helps to reduce induced EMI into the unit. The ADB-404 even comes equipped with 4 nice little rubber feet on the bottom, to help keep it from sliding around on a slick surface, or marring up the top of your Leslie. This is truly a “pro touring” grade of audio gear. Amplifier Outputs: 50K ohm 1/4" phone jacks on each channel. Mix Board Outputs: Dual parallel 600 ohm balanced XLR one each on front and back on each channel.